Q: Can you speak about what draws you to the Mexican and Guatemalan figures that you collect? 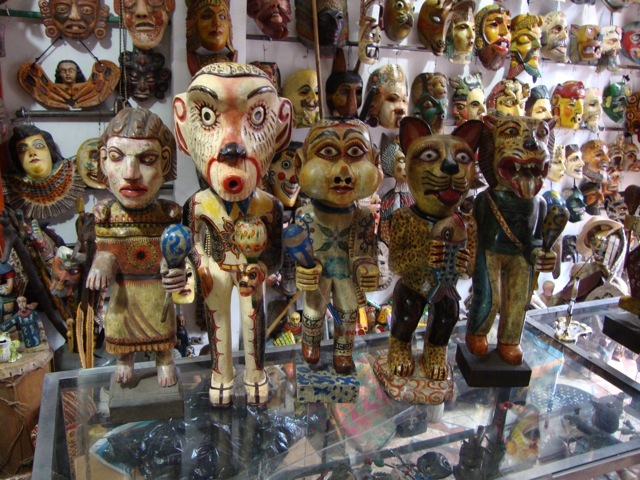 A: I search the markets and bazaars of Mexico, Guatemala, and elsewhere for folk art objects – masks, carved wooden animals, papier mache figures, children’s toys – to bring back to New York to paint and photograph. Color is very important – the brighter and the more eye-catching the patterns are on these objects the better – plus they must be unique and have lots of personality. I try not to buy anything mass-produced or obviously made for the tourist trade. The objects must have been used or otherwise look like they’ve had a life (i.e., been part of religious festivities) to draw my attention. How and where each one comes into my possession is an important part of my creative process. Finding, buying, and getting them back to the U.S. is always circuitous, but that, too, is part of the process, an adventure, and often a good story. Here’s an example. In 2009 I was in a small town on the shores of Lake Atitlan in Guatemala, called Panajachel. After returning from a boat ride across the lake, my friends and I were walking back to our hotel when we discovered a wonderful mask store. I spent some time looking around, made my selections, and was ready to buy five exquisitely-made standing wooden figures, when I learned that Tomas, the store owner, did not accept credit cards. I was heart-broken and thought, “Oh, no, I’ll have to leave them behind.” However, thanks to my good friend, Donna, whose Spanish is much more fluent than mine, the three of us brain-stormed until finally, Tomas had an idea. I could pay for the figures at the hotel up the block and in a few days when the hotel was paid by the credit card company, the hotel would pay Tomas. Fabulous! Tomas, Donna, and I walked to the hotel, where the transaction was made and the first hurdle was overcome. Working out the packing and shipping arrangements took another hour or two, but during that time Tomas and I became friends and exchanged telephone numbers (the store didn’t even have a telephone so he gave me the phone number of the post office next door, saying that when I called, he could easily run next door!). Most surprisingly, the package was waiting for me in New York when I returned home from Guatemala. Posted on December 14, 2013, in An Artist's Life, Black Paintings, Creative Process, Guatemala, Inspiration, Mexico, New York, NY, Pastel Painting, Photography, Travel and tagged accept, across, adventure, animals, arrangements, attention, bazaars, behind, better, block, boat, brain-stormed, brighter, buy, buying, called, carved, children, circuitous, color, company, creative, credit card, days, discovered, Donna Tang, draw, easily, elsewhere, exchanged, exquisitely, eye-catching, festivities, figures, finding, fluent, folk art, friends, Guatemala, heart-broken, home, hotel, hour, hurdle, idea, important, lake, Lake Atitlan, leave, life, looking, markets, mask, masks, mass-produced, Mexican, New York, objects, obviously, otherwise, overcome, owner, package, packing, paint, Panajachel, papier mache, pattern, pay, personality, phone, photograph, possession, post office, process, ready, religious, returned, returning, ride, search, selections, shipping, shop, Spanish, speak, spent, standing, store, story, surprisingly, telephone numbers, Tomas, tourist, toys, trade, transaction, unique, United States, waiting, walked, walking, wooden, working. Bookmark the permalink. 2 Comments. Holy Molly – I’m glad some one has a place for all these great chotzies as my Mother would say to later stay creative no matter what . Peter, for me they are so much more than tchochkes (sp?). They are the material evidence of a people, their beliefs, and their culture. They provide a glimpse into a fascinating world view. I could go on and on but will stop now.